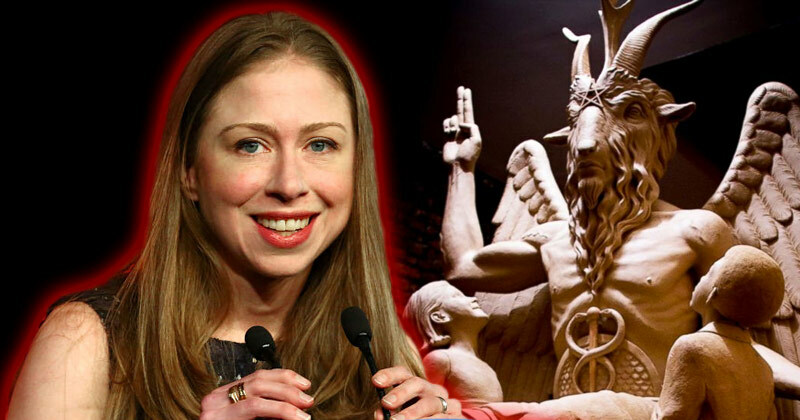 On January 2, 2018 Chelsea Clinton exchanged New Year's wishes with the Church of Satan, which was noted by a number of conservative commentators, to the point where reports then came out where she denied that she practices Satanism, but while one exchange in and of itself might get casually waved away, other events over the years concerning Chelsea, Hillary and Bill Clinton, shows a pattern that is hard to overlook. 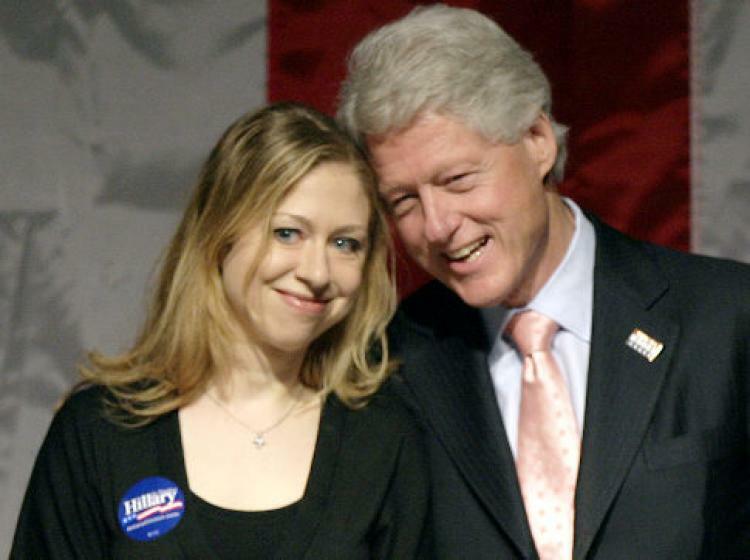 In response to criticism Chelsea started seeing on that thread, she said "Oh goodness gracious. We can be civil, cheerful, respectful to & friends with people who don’t share our religious beliefs. 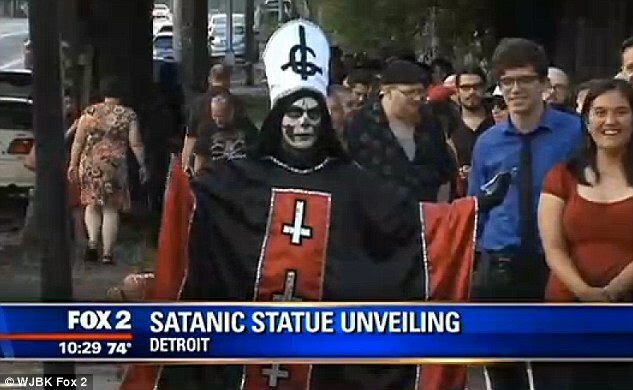 Sometimes, we even marry them. I’m a Methodist & my husband is Jewish, thank you for asking. A very happy New Year to you Rhonda!" 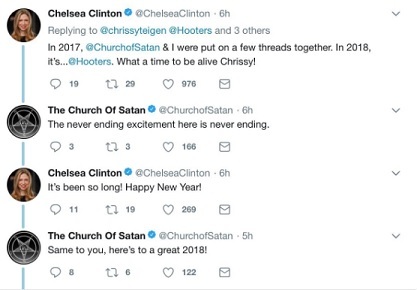 I'll note that often when responding to a post that someone else was tagged on, sometimes people do not carefully look at the names autofilled in that someone else had tagged, but as seen above, Chelsea is the one that mentioned the church of satan, then when they responded, she then wished them a Happy New Year. As a side note, just imagine if someone like Donald Trump Jr. had responded to someone that liberals felt was unsavory, wouldn't they have a field day pointing it out, howling about how that proves, by nothing more than a tweet association, that the Trump's were in cahoots with them..... oh wait, we don't have to imagine it, they screamed bloody murder when Don Trump Jr. responded to Wikileaks, three whole times. Chelsea Clinton also seems to make a habit of wearing an upside down cross necklace, which some would claim is the cross of Peter, but which is also used as an anti-religious symbol by satanists, as shown clearly in 2015, when supporters of the Satanic Temple wore the symbol at the unveiling of the goat-headed statue in Detroit, shown in the image above.